"Tirohanga o Mua began life as a catalogue for a retrospective exhibition by Robert Jahnke at Te Manawa Art Gallery in Palmerston North in 2010. But as the judging panel noted, "It is too substantial to just call it another exhibition catalogue". Along with a comprehensive catalo... read full description below. 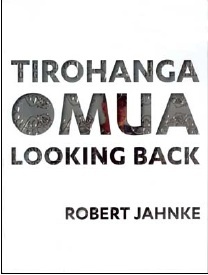 "Tirohanga o Mua began life as a catalogue for a retrospective exhibition by Robert Jahnke at Te Manawa Art Gallery in Palmerston North in 2010. But as the judging panel noted, "It is too substantial to just call it another exhibition catalogue". Along with a comprehensive catalogue of work covering some 20 years and an essay by Jahnke himself, the book also contains essays by Nicholas Thomas (director of Cambridge University's Museum of Archaeology and Anthropology) and Anna-Marie White (curator at Nelson's Suter Gallery and a former student of Professor Jahnke's). The catalogue also includes a conversation between artist Shane Cotton and Jahnke entitled Cotton and Jahnke Unplugged.." This book is the winner of the Arts catagory of the Nga Kupu Ora Maori Book Awards 2011.